Valor plum trees produce bounteous crops of attractive purple-blue fruit, occasionally with a hint of red. The sweet, juicy plums are versatile and can be eaten fresh or used for preserving, canning or drying. You can easily grow your own tree if you live in USDA plant hardiness zones 5 through 9. The good news is that Valor plum care is relatively uninvolved. 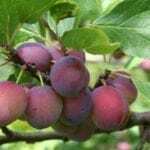 Read on to learn about growing Valor plums. Valor plum trees originated in 1968 at the Vineland Research Institute in Ontario, Canada. The trees are appreciated for their abundant harvests and the excellent flavor of the firm, amber flesh. Valor plum trees tend to be resistant to bacterial leaf spot. Look for Valor plums to ripen in late September or early October. Valor plums require at least one plum tree nearby for pollination. Good candidates include Opal, Stanley, Italian, Bluefire and other European plum varieties. Valor plum trees require at least six to eight hours of sunlight per day for healthy development of flower buds. 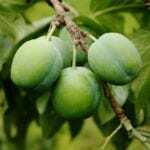 Valor plum trees are adaptable to nearly any well-drained, loamy soil. They shouldn’t be planted in heavy clay or extremely sandy soil. Improve poor soil by adding a generous amount of compost, manure or other organic material at planting time. If your soil is nutrient-rich, no fertilizer is needed until the tree begins bearing fruit, usually two to four years. At that point, provide a balanced, all-purpose fertilizer after bud break, but never after July 1. Prune Valor plum trees to maintain desired size in early spring or mid-summer. Remove branches that rub or cross other branches. Thin the center of the tree to improve air circulation. Remove water sprouts throughout the season. 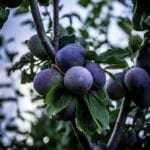 Thin plums during June or early July to improve fruit flavor and prevent limbs from breaking under the weight of the plums. Allow 3 to 4 inches (7.5 to 10 cm.) between each plum. Water a newly planted plum tree weekly during the first growing season. Once established, Valor plum trees require very little supplemental moisture. Provide the tree with a deep soaking every seven to 10 days during prolonged dry periods. Slightly dry soil is always better than soggy, waterlogged conditions. Beware of overwatering, which may result in rot or other moisture-related diseases.